Yes, I had made it to Monday morning, the day I thought would never come. But instead of the Earth-shattering freedom I assumed it would be, it felt like any other day. Now, I’d be lying if I said I wasn’t flat-out school girl giddy as I pulled on my beloved boots, or that I didn’t enjoy every single bite of the poached egg I paired with my oatmeal for breakfast, but as I analyzed how I felt, I realized veganism had started to become a habit, or routine for me. This was my favorite part of Monday. Yes, Monday morning I had to focus on NOT being vegan. Weird, huh? While I’ve decided living a vegan life is not for me personally, I have truly enjoyed this entire experience. I know, I’ve complained (a lot) but the point of this project was to attempt to live as vegan as possible, with an open mind, while still being completely honest about our thoughts and experiences. I hope those of you following along with David and I’s journey have felt like we have done so. Secondly, yes my skin did in fact turn blue. My family and boyfriend kept making comments about my skin “losing color.” My hands and feet were constantly cold, and I started having a really hard time waking up in the morning. Hello anemia!! This is MY fault, I already teeter on the edge of being anemic every so often, and then I eliminate my iron sources without supplementing it with vitamins. Dumb. Dumb. Dumb. I started taking an iron supplement and before the end of the project I was already feeling much better and beginning to regain color. Dani Smurf is not a good look for me. Basically what I’m trying to say with all this is everyone is different. I had several vegans inform me they had never experienced any of these side effects, and I completely believe them. We aren’t all cookie cutters (thank goodness), one persons experience with same principles can have very different results, than anothers. Fact of life. For me, my favorite part was the wonderful people I’ve gotten to interact with, whom normally because of our opposite lifestyles, I would’ve never known. Thank you all for the encouragement, feedback, advice, and conversation. I’m even thankful for those of you with negative feedback. You ALL made this project what it was. I would also like to say thank you to BEEF News Daily, PETA and HSUS (Yeah I know, it’s a cold day in Hell. ), and VegNews for the publicity and help throughout the past two weeks. 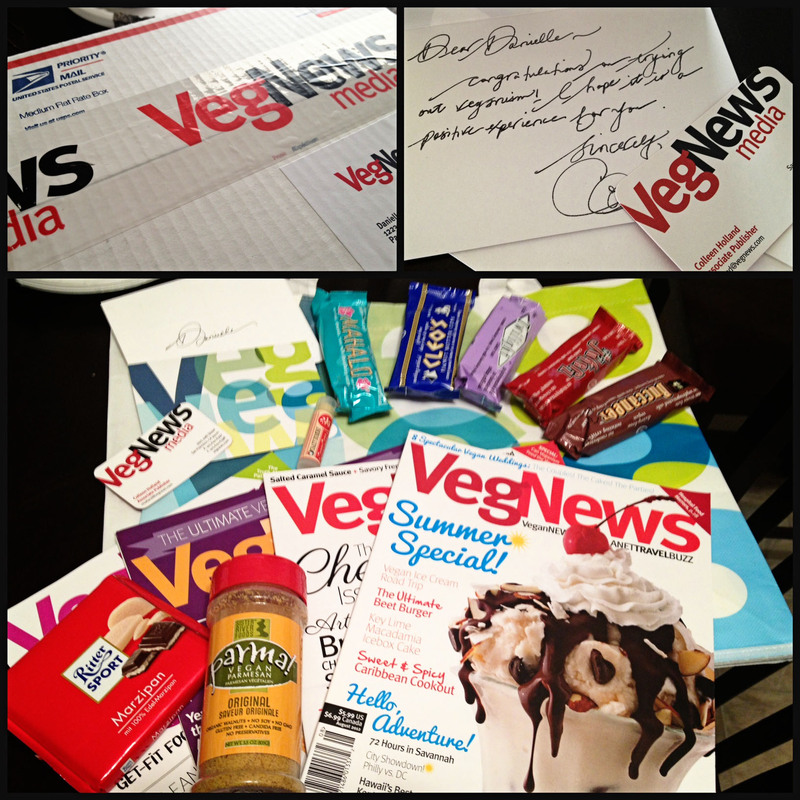 VegNews was so kind as to send me this awesome care package, I barely got a picture taken before I tore into the first chocolate bar (Chocolate=Happy Girl), but I think my favorite item in the package was the Crazy Rumors, candy cane flavored chapstick. It’s. Amazing. Even though this project is over, I hope all my new vegan followers will stick around, and continue to engage in conversation here. It is important to us to work to close the communication gap between producers and consumers (whoa look out, I’m dropping my Farm Talk Editor lingo now. ), drop the hate between meat-eaters and those with a plant based diet, and become more open to other ways of life. Be sure and check out my (no-longer) vegan compadre’s blog over at Farming America, and follow us at #DandDgovegan. I think my boots have missed me too. 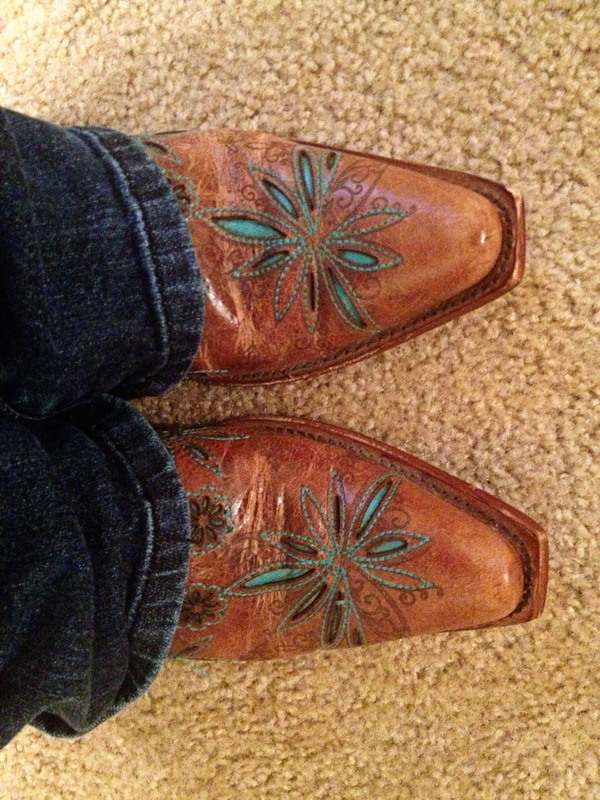 Are those last pair Corrals? I think I have the Cross version of those boots. (They’re amazing!) Welcome back to the world of fabulous footwear, cheese-lovers, and carnivorism, my dear! We’ve missed you! CONGRATULATIONS and I love those Corral boots! I’m glad it was a somewhat good experience! I’ll stick around. I’ve enjoyed reading so far. It brought me back to my Texan-Okie roots. 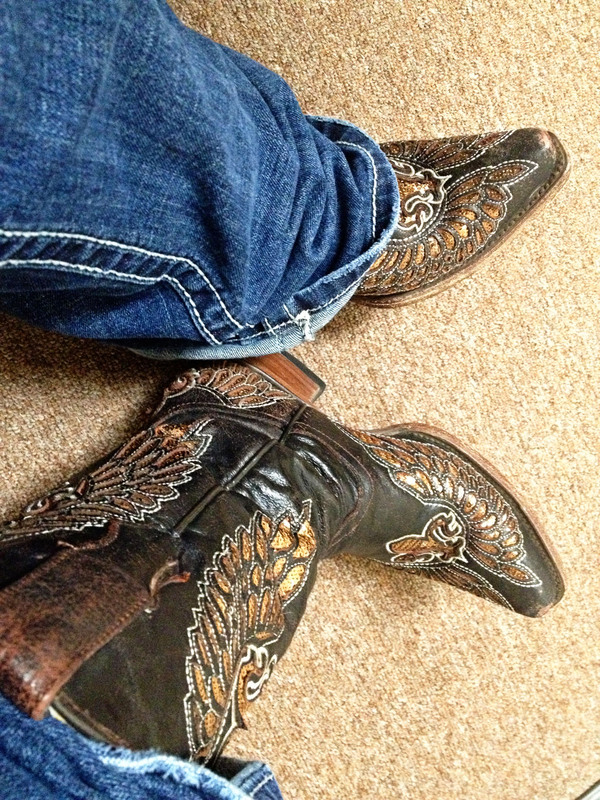 Congrats on completing your two weeks – love the boots! I would have a hard time living without mine as well. I already have low iron but eat lot of beef/pork/venison, I’d hate to see what would happen if I stopped. Glad your skin isn’t blue anymore!